Page from a 1959 Castle Hot Springs brochure touting the history and amenities of the springs and resort. President John F. Kennedy, the charismatic young leader cut down by gunfire in Dallas five decades ago today, has a little-known connection to our state. This link is not through electoral results (he lost Arizona to Richard Nixon in 1960 and likely would have lost the state to native son Barry Goldwater in the 1964 campaign), but instead as a result of his recuperative visits to Arizona’s warm, sunny climate. After suffering severe injuries while commanding his now-famous Navy vessel, PT-109, Kennedy convalesced at Castle Hot Springs, a resort destination northwest of Phoenix normally frequented by moneyed elites bearing names such as Rockefeller, Carnegie, and Wrigley. However, the posh hotel and spa served an entirely different purpose during World War II, when it was used as an Army Air Forces recuperation facility. Having already experienced the restorative powers of our year-round sunshine during a 1930s stint as an Arizona ranch hand, JFK and his family saw potential in the state’s warm winter weather and the “health-giving effects” of the resort’s namesake hot springs. 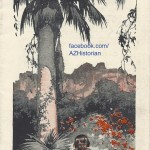 The hot springs were long-known by inhabitants of the land that would become Arizona, with Native Americans reputedly enjoying the health benefits of the 122-degree water long before any European nation controlled the area. The commercial appeal of the natural attraction proved irresistible by 1896, when the first resort opened at the site. Mid-century advertising for the Castle Hot Springs Hotel boasts of spring water “most palatable and wonderfully relaxing to bathe in.” Excluding a brief break in operations during the Second World War, the facility welcomed guests seeking the supposed revitalizing power of its waters for a full eighty years, closing in 1976 after falling victim to a catastrophic fire. The grand desert destination later served as an ASU-owned conference center, but is now all but abandoned, existing only as a handful of shuttered buildings awaiting a renewal akin to the those experienced by so many of its aching guests. 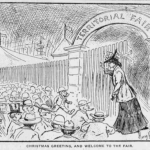 A cartoon published on the frontpage of the December 25th, 1905 Arizona Republican shows Miss Phoenix proudly welcoming fairgoers to the new Territorial Fairgrounds. 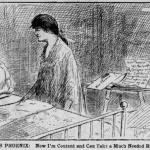 A cartoon printed on the frontpage of the December 31st, 1905 Arizona Republican showing a tired but proud Miss Phoenix preparing for a well-deserved rest after a successful Territorial Fair. The Arizona State Fair, which opened on October 11th and will run through November 3rd, has been held at its present location since December of 1905, when the celebration was known as the Arizona Territorial Fair in recognition of the soon-to-be state’s legal status within the Union. Initially staged in 1884 on land adjacent to the Salt River, the fair was forced into hiatus following the then undammed river’s catastrophic 1891 flood. By mid-1905, a group Arizona civic leaders hoping to resume fair activities organized the Arizona Territorial Fair Association. This entity paid $9,200 for eighty acres of land at what the Los Angeles Times reported to be “an especially good” location with the intent of providing a new home for the displaced fair.